Hard disk technology was pioneered by IBM researchers, beginning with the RAMAC disk drive in the fifties, and including the Winchester drive in the sixties, and magneto-resistive heads in the nineties. Floppy disk drives were a later derivative of hard disk technology. 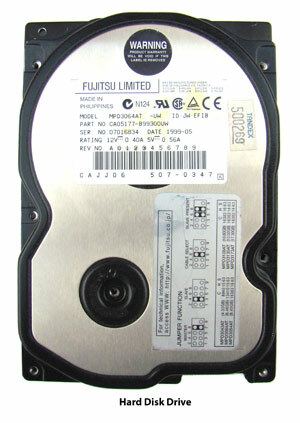 A typical hard disk consists of two to eight rigid disks with data stored on both sides of each disk. Each side has its own read-write head mounted on an armature so that it can be positioned anywhere over the surface of the disk. The heads rotate around a central spindle at speeds of 3 600 to 12 000 RPM. The position of the head arm in hard drives is controlled by a device known as a voice coil actuator. 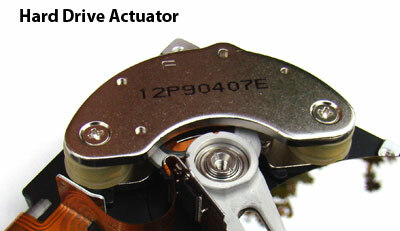 The actuator is an electromagnetic coil which moves the head arm magnetically. The armature controller receives feedback from positional data written on the disk when it is manufactured. In some systems an entire side of one platter is used for positional information, but in most disks, the positional code is written in wedges between the data sectors. The positional information is encoded using a variation of binary known as the Gray code which is frequently used in applications such as robotics and automation, where constant feedback on the position of parts of the machine is necessary. In binary code, the number following 0111 is 1000: every bit must change, although the difference is only 1. The numbers in Gray code are chosen so that only one bit changes between each adjacent number in a sequence. That reduces the likelihood of errors in the transmission of information. The four-bit Gray code is shown on the table below. The heads are aerodynamically designed so that a cushion of air separates the heads from the surface of the disk at all times. In order to reduce the size of the heads and increase the density of data on the disk, the original ferrite core/wire coil design has been replaced. 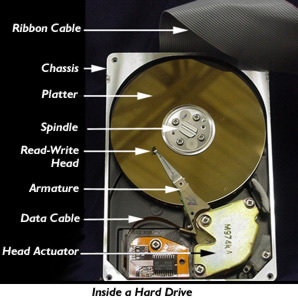 Currently, hard disks have separate read and write heads on each head arm. Thin Film heads are manufactured in a manner similar to ICs. The core is a nickel-iron alloy and the gap is sealed with aluminum. They are now used primarily for writing data. Magneto-resistive heads give exceptional read sensitivity. A small sense current flows constantly through the head. The conductivity of the head changes in response to changes in the magnetic field, in turn altering the sense current. 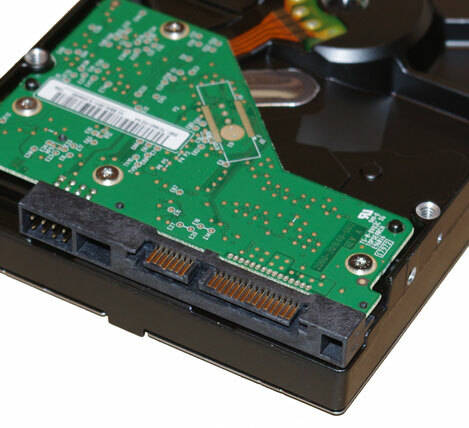 Each hard disk has a printed circuit board attached which interfaces between the disk and the remainder of the system. The tasks which must be performed by the controller are so complex that it usually has two dedicated microprocessors on the board. The Servo controller must process information from the FAT and the positional data from the embedded servos and send signals to the head actuator to position the heads correctly on the disk. During a write operation, the second microprocessor receives binary data through the IDE cable, encodes it using RLL or a similar method, and then sends it to be recorded on a blank portion of the disk. During the read cycle, the data must be changed back to binary format before it is transmitted over the IDE cable to the motherboard. Hard disk controllers now also include substantial RAM memory on the board to serve as a buffer, or temporary storage area. When installing an IDE hard drive, it must be connected to the mainboard through a data cable. The first hard disk should be connected to the primary IDE connector. A power cable must be connected which provides 5-volt power to the controller and 12-volt power to the spindle motor. There are jumpers on the rear of the drive next to the power and data connectors, which must be correctly set. Two drives can be connected to each IDE connector on the mainboard using a double-headed cable. One drive must be configured using the jumpers to be the "master", while the second is the "slave". As a rule, CD-ROM drives should be connected to the secondary IDE connector, since they use a different protocol (ATAPI) for data transfer. In order to store the data on the disk in such a way that it can be retrieved, the disk must be divided into sections. The path that the heads follow as the disk rotates are known as tracks. The tracks are divided into sectors during a process known as low-level formatting. The operating system performs a high-level format of the disk. In this process, the disk is first scanned for bad sectors, which are marked so that they will not be used for storing data. The first sector on the first disk side is reserved for the boot sector, which is where the information regarding the size and partitioning of the disk is stored. If this data is damaged, the disk is rendered unusable. An index of the file locations on the disk-known as the File Allocation Table, or FAT-is created and stored in the second sector of the disk. The FAT enables the operating system to create files and directories on the disk. If the disk is to be used as the primary (C:\) drive, then the first files created on the disk must be the operating system files. For DOS, there are three essential files: IO.SYS, MSDOS.SYS, and COMMAND.COM. Since the file system is created by the operating system, it is unreadable by incompatible operating systems. UNIX, LINUX, MAC/OS, each use a unique file system. FAT32, which makes more efficient use of disk space, and can be used with larger hard drives, was introduced as an add-on to Windows 95, and is used in Windows 98 and SE. Windows NT, Windows 2000 and Windows XP use NTFS. A hard drive may be subdivided into smaller sections known as partitions. Usually this is done using FDISK before the disk is formatted, because FDISK erases the FAT, effectively erasing any data stored on the disk. Programs such as Partition Magic, however, can change the number and size of partitions on a disk while preserving the data. The subdivisions on the physical disk, which appear to the operating system as separate disks, are known as logical drives. Generally, only one drive-the primary drive-can be bootable. However, boot manager utilities can circumvent this limitation and create two or more bootable drives by hiding the other drive[s] from the one which is in use. Seek Time: The time it takes the processor to find data on the diskthe seek timeis usually in the range of 8ms, far longer than it is for RAM. Data Transfer Rate: Once the data is located, however, it can be moved to RAM or to another device at up to 100MB/sec or morethis is called the data transfer rate. Areal Density: The factor which has been creating larger and larger drives in recent years is areal density: the amount of data in a given area. Hard disk density is now greater than 10 Gigabits per square inch. MTBF: Mean Time Between Failures is a measure of the reliability of the disk.